THE MULTIPLAYER VERSION DOES F*CKING WORK NOW! BUG-FIXES. Ok, I've took care of the old bug with preset outcome on d4 that caused to flip its face numbers. Also d10 now reads the "0" face as 10 instead of 0. I wrote it during practicing in WebGL (actually, it uses beautiful three.js and cannon.js). It also uses random.org to produce true random numbers (from atmospheric noise). The main goal is to make a soulful place to roll dices. I did not want a simple calculator as if you clicking a button and they showing you just bald digits in a result. There are a lot of such online textual rollers on the Internet. They are completely ugly ones. No offence, just facts. Rolling dices is one of most significant and emotional part of roleplay board games, such as Dangeons and Dragons. While playing D&D you have to roll dices often, but you will never say: "Oh, this is so tedious". Otherwise, you adore this. You may even have your own set of dices, nicely colored and with sweet texture. You do not want random generator, you want an act of creation, process that extended in time, intrigue with dices stopping rolling one-by-one. And that is more valuable after all is that you want to be a participant of random. It is great to know that good values are your merit, while bad ones are just a bad luck. This is the reason why my roller have no "Roll" button. To roll you should do a gesture by yourself. This will bring some of your personality into an random act; breathe life into mechanical action. And you will take pleasure in it. Also note that the roller uses true random numbers from random.org as additional advantage of realy random creation. This is not an ugly computer digital counting. I also added textual notation for future use. It is quite simple by now, but who knows, maybe I will implement more complex forms. See http://en.wikipedia.org/wiki/Dice_notation for more info. UPDATE for 4 Aug 2014. In additional, I added a quick URL params as it was suggested. 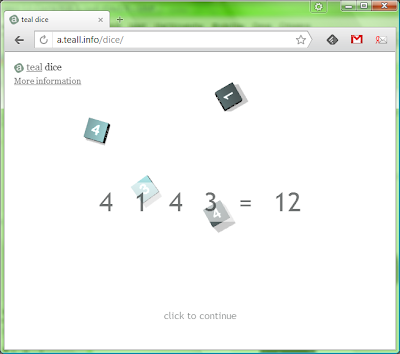 Now it is able to set notation via URL like this: "a.teall.info/dice/?notation=3d8". If param "roll" is present, roller will run a throw instead of showng selector page. For example: "a.teall.info/dice/?notation=3d8&roll". For those who wants to get throw result: it is located in DOM element with id "label". I will try to add more complicated forms of dice notation. UPDATE for 21 Jan 2016. I added support for preset result. In notation you may enter comma- or space-separated result after "@" symbol in the order of given notation. For example: "4d4 @ 1 1 1 1" will outcome all d4 dice values to be "1". Hi! Are you working on this project? What about to implement random.org webservice? i really want to use it in my Mephit.it project that allows to play D&D 3.5 in your browser. I'd like to pregenerate the results and then animate the launch, can you help me to do this? Can we discuss via mail? Actually you can view my project in Italian only, but in my development server is almost completely translated in English too. Where can i download it? Do you have a github or sourceforge page? Note that it may run as stand-alone page. Also I added GAE python script from my server side that uses as a proxy to random.org API. This is super cool. Any progress on the multiplayer? What library were you going to use for that? Unfortunately, I have no time for multiplayer yet now, but idea is still on. First attempt was to use the Google AppEngine, it is the simplest solution for me because I use their back-end. I.e., GAE on server-side to communicate and authorize clients with AJAX. Multiplayer is not so hard to be wrote, but, you know, it have to be tested hard. I hope, later I will find a time and a motivation to finish it. Any news about multiplayer version? You will be the first to create an online 3d dice roller! This is yet beta version, without log and async throws. Cool! You will continue to update this with a log/chat? Something like the site rolz do with the room? Yep, log will be look like one the rolz.org has. I will update main page (a.teall.info/mdice) as log will be done. Ok thanks man, i really appreciate this! Check UPDATE section of this post, I added this URL params functionality during lunch break =) You can run it in embedded frame and check if element "label" is visible - this indicates that roll is over. Then get results and parse it. Can I put a background image? But can not I create a 2d image background is a photograph? Actually texture is a 2d image already =) It doesn't matter that it is, photo, drawing or painting =) If I understand you correctly. How to change background color should be white to red? If you need to modify any part of your source? Are you unable to change the background color? It is quite easy. Open dice.js, find line 348, replace 0xf0f0f0 abmient light value to, let's say, 0x606060. Next, find line 375, replace 0xffffff with your color value. This will change color of desk. If you want to change background color of selector page additionaly, find line 560, replace 0xfbfbfb with your color value. Also, check three.js documentation to find out how color works. If you'd have some more questions, write me directly to email teal.na@gmail.com. Any reason why it doesnt run on Firefox? Strange news. What version and platform do you use? I have the latest Firefox for Windows version on my PC, and it running good. I am currently using Firefox 33.1.1 on W7, i have tried Chrome, IE11, Opera and Safari and the problem seems to be Firefox alone. I got to see "Loading libraries, please wait a bit", and then nothing. Thanks for info. I know about such problems. I have Chrome 40.0.2214.91 m and it works fine for me. So this is obviously not up to browser, but something else. If you have a time, could you send me error message the browser has genetated? To get it on Chrome, press Ctrl-Shift-I and check 'Console' tab after the dice roller loaded. p.s. Note how the world has changed... Several years ago IE was a sort of crap and your work was to make your code working on 'good browsers' and damned IE =) Now everything always runs fine on IE, but not on 'good browsers'. This is an awesome dice roller, but I have a tough question. After rolling the dice, could it be possible to re-roll just one or more of the dice by clicking on them (instead of a total reset)? The re-roll would then add to the total, like exploding dice from many popular games like Savage Worlds or Shadowrun. I also noticed on Roll20.net there is also a label that moves with their 3D dice. Is that possible here? It would be cool if when a die came up with its max number (like a 6 on a 1d6) a label would come out next to the die and say "Roll This Again!". Anyways, great job and thanks for your consideration. Cool job this is! Would you please let me know the license of it? Thanks. You can assume that it has the MIT license (or that else) if you wish so. I do not love any licenses at all and prefer to simply say that it is completely free =) Good luck! When a die landed (perfectly?) on its edge, it counted as a -1. If, after three seconds of rolling, proper numbers haven't landed, I wonder if it could re-roll automatically? Still love the tool. Thank you for creating it. Known issue. A die stops exactly in a way the ray tracer hits its unnumbered edge. You are right, die have to be re-rolled in such case. During next iteration of update I'm going to fix this. Thanks. Is it possible to preset the dice outcome? Not in this version. And I think this is a case when the game isn't worth the candle. But well, it's possible by prerender rolling process without showing it to user, - and this will take some time. Then you should catch the numbers in pre-result, rotate dice to correspond position to meet your desired outcome, and then roll them again to show the process to user. This is the only way that guarantees correct rolling. Hi Anton, thanks for the great dice roller! I have the same question as Michael. I need to generate "winning" numbers before I can show the dice roller, because the next stage of the game depends on the results of all players. I generate the winning numbers for each player, write them into a database (SQL), and then I was hoping to throw the 3D dice roller preset with the numbers coming from the database. I've spent quite some with your program today, but unsuccessfully. Could you please help? Ok. I have received a thousand requests for the roller next updates. It seems I have to find time and finish it at last. I will focus on log/chat in multiplayer version, and pre-generated rolls for single-player one. If you have concrete questions, feel free to write me e-mail. If you still interested, I got free time and did added preset result =) See update section of this post. Thank you for the great dice roller. I'm working on a Ludo game and for someone with minimal 3D knowledge, this is a lifesaver. When/if complete, I'll surely reference this on the site. I am thinking of making some change to the roller so that I can generate the throw vectors on the server. My question is, will the same dice result be produced for same throw vectors on different clients running on different machines, different browser? Thanks again for your great effort. Yes, the thing you are asking for is already works, you can download multiplayer version to learn how this can be done. One guy told me that he had a problem on his machine during multiplayer session, but I think this was the only case. 1) When player is start rolling, client sends to server set of dice positions and velocities (the set of vectors). Animation is not performed. 2) Server receives this set of vectors and sends it back to all clients in the room (including one who started roll) via long-polling. 3) Clients receive the set of vectors and do animation. 4) All players in the room see equal rolling and its result. This is really awesome, thank you for making it! Could I use footage of this dice roller for my YouTube gaming account? I would use it as an intro to my videos, and I would be very happy to source you in each of the videos I would use it in. Thanks, Rebecca. Of course, you are welcome to use it. Good luck! I dont know what's exactly what is the meaning of dice.py in source code? dice.py is a part of a server-side code of my GAE server. I put it as an example of how to work with random.org API. It is not necessary in general cases, but if you want to use the random.org services. Wow, jut wow! I had an idea how proper 3d dice roll with preset result should be done (animation precalculation and stuff) but i'm really surprised that i was able to google out an open source thingy doing just this! I mean this dicer is just simply amazing! Now i'm really curious to look at the code itself, and planning to use it as an awesome frontend display of backend calculated results. Нет, ну серьезно, может я преувеличиваю, но по моему вы создали потрясный кусок кода, мсье. Кудосы, поклоны и все прочее, спасибо! Последний коммент мой, профиль как-то сходу не хуканулся. Вернулся выразить еще одно почтение за человечески написанный код, аж читать приятно. Yes, I know about this problem. I will try to focus on it on my next attempt when I have free time. This is all up to google app engine, not me =) Seriously, maybe we have to wait while google make correct sockets... Or, anyway, I will try to rewrite socket long-pull mechanics, let's see. Howdy -- great stuff! I can't seem to figure out which parameters to change if I wanted a two dice to "settle" in a defined spot on the screen... For example, instead of the dice flying around the screen at random angles and settling in random locations, is there a way I could define a small square area where they will end up settling? I have a game where I'd like the dice roll to be contained to a defined area so they don't interfere with the user controls, scoreboard, etc. :) Thanks! Hello. There are two different ways to get what you want. First one is to move rigid-body borders of box, so dice will live only within small predefined area of screen. A throw should be very accurate, with small horizontal velocity. Second way is to emulate throw before rendering, relatively shift starting coordinates and box borders, and only then render dice roll itself, and dice will stop exactly in your predefined area. Thanks for the quick response! Trying to figure out which function handles the starting coordinates ;) -- For your second option, is that defined in the throw_dices function of the dice.js file? This looks awesome. I want to roll dice (with letters on them instead of numbers) for a logic game, and this will do a great job. Hi! This is possible, of course. You just have to replace dice face numbers (1, 2, 3 etc.) with astro-character set, see this.standart_d20_dice_face_labels in dice.js. I can make ready-to-use version for you, but it will cost you ;) -- but not so much, write me email (teal.na@gmail.com) if you are interested. Excellent work and thank you for the source. This is a fantastic piece of work! Is it possible to change the size of the dice ? It's a really good job! How to do this? Because on a phone the dice is too small. It's not possible via game itself, only if you're modifying source codes. There is variable named scale. I will see if I can adjust scale to be chosen automatically for phones or whatever with small screen. Tried to set the scale variable on my iPhone, but it does not seem to affect the size of the dice at all. Has someone been successful in adjusting the size, and how did you do it? I am just curious why this amazing dice script doesn't work on my mobile platform. Is the code mobile friendly or should I look for the problem in my mobile device? It should work. At least, it works on my phones ;) To be serious, try to check your phone's webgl support here: http://webglreport.com/, or check how it runs some of public webgl tests. The answer is somewhere there. 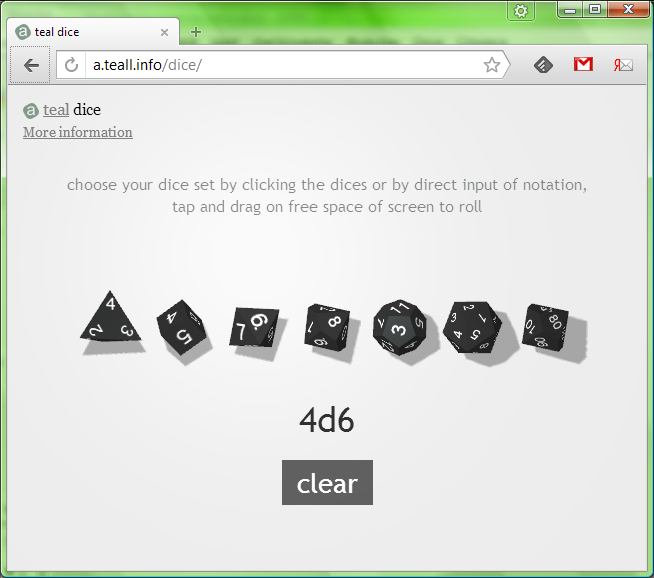 you can use link like this: a.teall.info/dice/?notation=1d6 (but selector will be still visible). Or if you are making some project, I can prepare special version for you. Write me teal.na@gmail.com if you have questions. Hi great program for online D&D, I dislike the click and get random number and really like to see the dice roll.. just feels better. But some days I think the server is overloaded and we can't get into a multiplayer room together. Anyway we can host it ourselves or do you have a standalone program with multiplayer. What would I need to do in order to run a rand() function instead of using the random.org API so that it can be run offline? Also, what direction would you point me in if I wanted my app to display this your dice roller and return the dice roll result? I love the visual feedback of rolling dice, but I do have one complaint. The way d10's are being added is sort of wrong. It's counting results of "0" as the number 0, taking the die number literally. But a d10 typically, if not always, is supposed to generate a number between 1 and 10, with 0 representing "10." This is fairly important for the d20 systems, White Wolf systems, and other popular gaming systems. Any way it could be implemented without players having to remember to add 1 to each d10 roll, or manually convert results of 0 to 10? Is possible to roll fudge Dices? thanks for these awesome dice and the mechanic behind them! As you said earlier, that your code is released under public domain, I forked it and released a more modular script, with which other people can easily add dice to their own threejs projects with the possibility to set the value after fall. Still, all credits go to you, thanks for creating the code! Can multiple users see the same result? Can you tell me how to do it? Please. Can you please tell me what that is? teal.js is a set of my own wrapper-functions over plain js. You can cut almost half of it without any sorrow. Hi Anton, I am using dice roller over a background video, but dice canvas shows a white background. How can I make background transparent instead of that white color? Could you please help me? Anton, I don't know how easy this is, or if it's even possible (not familiar with all the libraries you use), but the physics just seem to be a tad sticky. More often than not, the dice seems to hit the surface and stick, causing it to heavily slow down and even stop spinning. Almost as if the dice and table are covered in a thin layer of... well, something sticky. I imagine changing something like this is out of the scope of your work, but just in case it's not, I really think if the physics of the table or the dice were tweaked to be less sticky, it would be a lot better, even if it's already fine. Then again, I don't know how much random.org has to do with the final roll. If you're getting the final roll, and the physics engine is just getting it to the number, then I guess we're out of luck. Hello, I'd like to use your dice roller for my animation. Do I have your permission to use it? This can be fixed by adding "|| notation.constant)" to the if statement on line 61 of main.js. Confirmed working locally without console errors. Thanks! I made another couple fixes, which addressed a few behaviors. On Chrome and Opera, preventDefault is ignored for the touchstart event listener. On my devices this caused a doubletap. There's a 'passive' option supported by those browsers to prevent this. Once I implemented this, single taps stopped registering while swipes were fine. Turns out there's a function in main.js that's missing the touchend event listener. Adding the missing string gave me responsive single taps. For my personal use, I've added code to POST roll results to my Discord channel using a webhook. I'm starting a tabletop RPG campaign and we all live pretty far from each other, which makes online play necessary. This is a much more fun and tactile way for us to resolve dicerolls, and no serverside code for me to write! Would love to be able to roll the dice on a see-through background, but cannot figure how to make this scene have a transparent background. I have made the canvas transparent, added alpha: true to WebGLRenderer, setClearColor to alpha: 0, and set the object to near-transparent. Still the background stays opaque white. What am I missing? After a lot of things tried, the real problem is controlling the transparency of the underlying UIWebView on iPhone - so nothing for this forum, really. First of all, fantastic project, it looks great! Some problem with the probabilities here. In short, the dice rolls seem to provide too good results. As a proof case, try rolling 2d10 and see how long it takes you to get a result that sums to less than 10. The dice is first rolled with the physics enginge behind the scenes, until it has finished. Now the system nows, what side is upside and swaps the textures of all sides so that the random generated number is up. Then the same dice roll is executed again and this time shown to the fronend. For the randomness: He stated right at the beginning: "It also uses random.org to produce true random numbers (from atmospheric noise)." I just found some problems trying to create a multiplayer room. Is there something wrong? It never stop loading once i try to create a room. Thank you for creating this cool place to roll dices! Noticed the multiplayer room crashes when trying to make a room. The problem is acknowledged, I looking for time to manage a fix. Trying fhe option to roll a particular preset i find a little problem. If it is rolled a d100 or a d100 + d10 and for the first dice the preset input is 9 the dice roll not accept the preset in most of th e occasion. Hi. Still working on it, sorry for a long time to get rid of this. I just want to suggest, or ask, to fix the multiplayer bug.. if it had a self database, wouldn't it work? I have an account for a website, a server with SQL, maybe if i could install the dice room in my server, making a db, wouldn't be better? Just add "[2, 2, 2, 2]" in callback in beforeThrow (like said in comment), change 4D6 by 4D4 and start... you will see the bug. This is known issue, not easy to fix. I will move on it after fixing multiplayer bugs. Thx to notify me when fixed, it's great animation tool !! Would and incentive $ help to fix the issue? Our RPG team would like to continue using this amazing tool! Hello! Still workong on this? I love your post. So can I add images(cat,dog,bird,..) into dice instead of number(1,2,3...). Can you help me. how can i manage width and height of dice container? Hi Anton, great work on this simulator. I would like to add sound (shake and rolling of dice) to the script. Any suggestions on how I may accomplish this ? Will it be necessary for me to create a member function for dice in order to make this happen ? Would you still recommend using webgl these days, or know of any alternatives that might work better? Are you free for a little bit of paid programming work? Great Job! You would add the support to create new char, for exemple roll 4d6 and drop minor value. Ex. : 6 + 4 + 3 + 1 (drop) = 13. Hi, best online dice type thing, well done. Would it be possible to have custom dice so that you can put an instruction or question on each side of the dice, such as 'Who was the main character?" or, "Draw the character's weapon." I would love to use it for activities in the classroom. Have you given up on multiplayer?? I rewrited server-side code. Now it works. Hello, thanks for your work and thanks for making it available for the public. It's guys like you that make internet awesome ! Love the app! Just noticed an issue, when rolling 12d10, the 0 faces are being treated as 0 and not 10.